Miami, FL (March 21, 2018) – On March 20, 2018, MBF (MBF) celebrated 22 City of Miami small business owners graduating from its seventh Small Business Training. The graduation ceremony took place 6:30 pm to 8:00 at the Little Haiti Cultural Center on 212 NE 59th Terrace Miami, FL 33137. 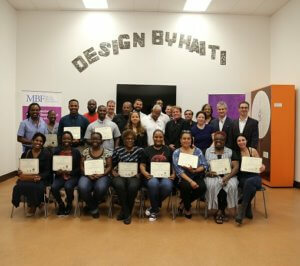 MBF’s Board members and workshop guest speakers as well as possible funders attended the graduation. Workshop trainees Bahamian Grill Connection, Motherland Trading, and Cream Parlor provided the food and desserts. – Michele Fievre, Fievre & Fievre, Inc. In order to graduate, the small business trainees must have attended eight out of the ten classes. During the final workshop session, the small business trainees presented their executive summaries to a panel of loan agency representatives from 500 Start-Ups, Marquis Bank, Accion, Biscayne Bank, and MBF. The first training group consisted of 25 participants that graduated on October 28, 2015. The feedback from the first cohort of students has been overwhelmingly positive. Many students noted that bookkeeping, financial reporting, information on how to acquire loans, and marketing were the most important topics they learned about during the workshop. In the spirit of advancing economic development in the City of Miami, MBF has also provided 68 loans to minority-owned businesses that have helped create more than 350 jobs in the City of Miami and created partnerships that have helped train more than 150 City of Miami minority business owners.